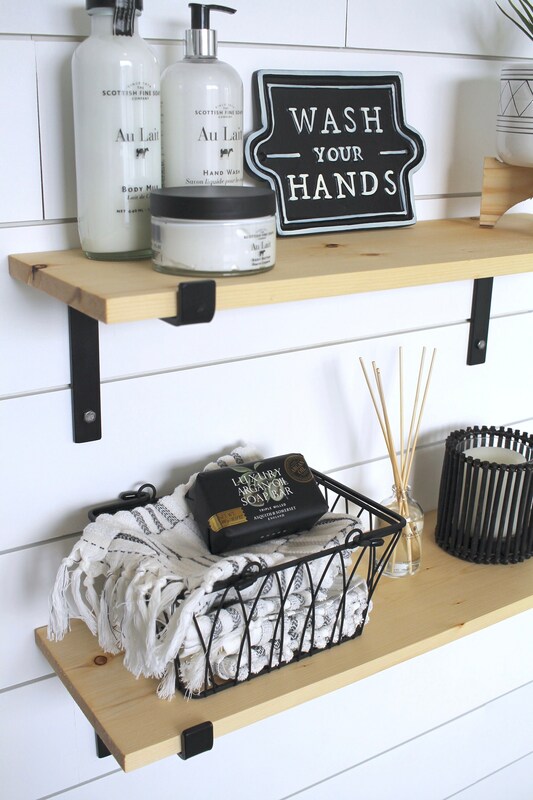 Open shelving is a staple design concept when you want to incorporate a modern farmhouse feel and/or rustic industrial style into your home. The mix of wood & metal helps you accomplish that much desired look in a way that is simple, yet timelessly stylish. 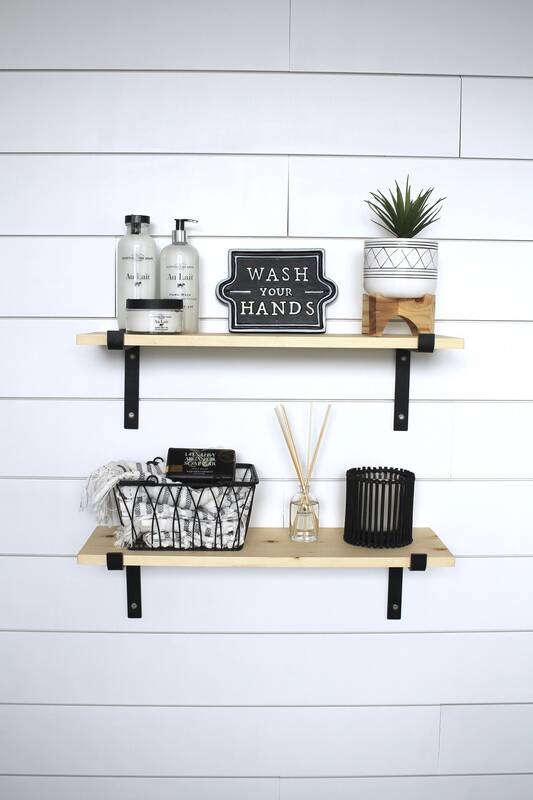 These shelves will make quite the statement in your kitchen, dining room, living room, bedroom, bathroom... anywhere! 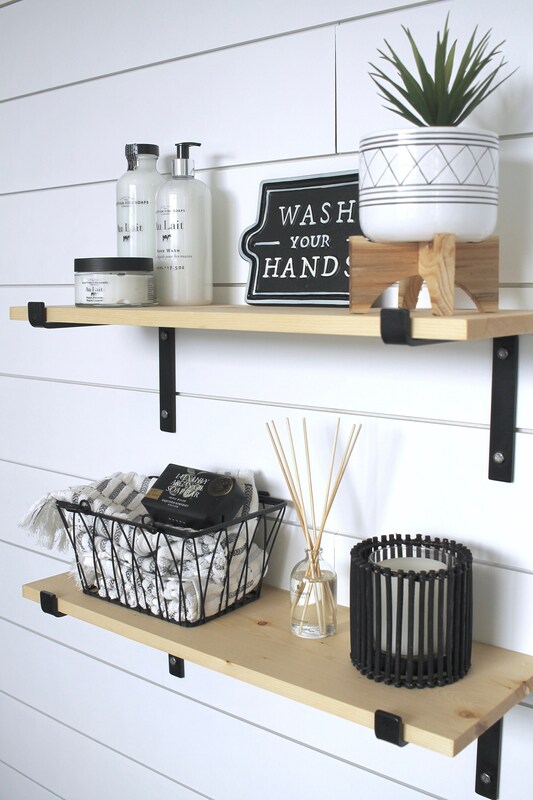 These shelves are so versatile & are not only beautiful, but extremely functional as well. These shelves are extremely high quality. The wood is carefully selected, sanded smooth with industrial grade equipment, stained in a water based finish & mounted on hand forged metal brackets! Q: Is this listing for 1 or 2 shelves? A: The listing is for 1 shelf. If you would like more than one, please select the number of shelves in the dropdown menu. Shipping is combined & discounted for purchasing multiple items! Q: What stain/finish is pictured in the main listing photo? Q: What dimensions is pictured in the main listing photo? Q: What are the dimensions of the usable shelf space? A: We offer depths of 5.5", 7.25", 9.25", and 11.25". This is also how far the shelf sticks out from the wall. Q: What is the thickness of the shelves? Q: What finish do you offer for the metal brackets? Q: How many brackets come with my shelves? Q: How do these shelves mount on the wall? A: Each shelf comes with hand forged metal brackets and necessary lag screws for installation. We strongly recommend mounting the brackets in studs, if mounting into studs is not possible for your application we suggest purchasing toggle bolts. Q: How much weight do these shelves hold? A: Our shelves have been tested to hold up to 75lbs when mounted & installed using studs. If using toggle bolts for mounting, the toggle bolts will be rated for a specific weight capacity. ♡ Note: These photographs provide a portrayal of what will be manufactured for you upon your order. Every piece of wood is different & slight diversity is to be expected in the wood grain, knots & the color of the stained wood captured in the photos might vary slightly also. ➳At this time, Dunn Rustic Designs accepts Paypal, Major Credit Cards, Debit Cards & Etsy Gift Cards. ➳During the checkout process, please carefully enter your exact name & correct shipping address. Any incorrect information can cause a delay in processing your order. ➳We ship all orders either USPS Priority Mail or FedEx Home Delivery. Transit time is between 1-7 days depending on the shipping message. Other factors include holidays, weather, etc, for this reason we cannot be responsible for delays during shipping. ➳We are not responsible for lost/damage items, however we will work with each customer on a case by case basis to ensure each customer is 100% satisfied. ➳Please do not use a PO Box as your shipping address. FedEx does not allow shipments to PO Boxes, for this reason we ask that you use a home/business address. ➳We accept orders from all 50 states, US territories, and APO's. However, we do ask if your shipping address is Alaska, Hawaii, any US territory, or an APO you contact us to calculate custom shipping prices. Each item is handmade to order, meaning that we have set return and cancellation policies in place. By purchasing from our shop, you are agreeing to these terms. To cancel any order, you must contact us via Etsy Message within 48 hours after the order is placed. After 48 hours, you will be subject to a 20% restocking fee. You must contact us within 14 days after you receive the product in order for your return to be accepted. If it has exceeded 14 business days we will not accept returns on any item. You will be liable for return shipping and for the cost of shipping that we paid to ship the item to you. We do not accept returns on custom items that include; custom stains, dimensions, items, etc. We cannot resell or restock custom items for this reason. If there is any damage you must contact us via Etsy Message within 24 hours to let us know that the item arrived damaged. Please provide us with photos of the damage & also a photo of the original shipping box, and we will replace the item at no cost to you. We do not offer refunds on items that arrived damaged, we only replace the damaged item. ➳Please keep in mind we review each cancellation/return request on a case by case and our goal is to ensure the customer is 100% satisfied. Please do not hesitate to contact us with any questions or concerns you may have. Local to the Phoenix, AZ area? Please contact us for local pickup and a coupon code to receive free shipping! We love doing business with local customers and being able to meet face to face with other families! How much weight do your shelves hold? Our shelves can hold 50 lbs+ when installed properly. For best installation results, mounting into studs is best. However, we do include drywall anchors as well. Do you include hanging hardware? Yes! We include all hanging hardware including screws and drywall anchors. We also include mounting instructions as well as specific instructions that pertain to individual products. If you have any further questions feel free to message us! Our current production time is 2-3 weeks. We do offer a "Rush My Order" listing that can be purchased to put your order at the top of the list. If there is a specific date you need your order by, please contact us prior to ordering. Where can I view all of your stain options? You can view all of our stain options on the last picture of every listing. 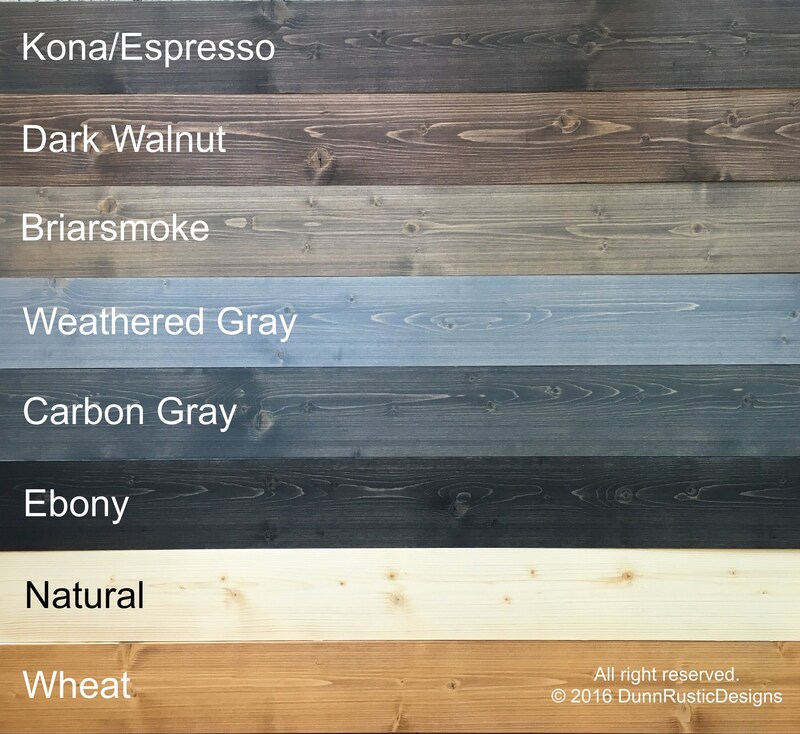 Also, follow us on IG, @dunnrusticdesigns, for customer photos, updates, product pictures, and more! We love doing custom orders! Whether that means editing a current product's dimensions, color, etc. or an entirely new product, we would love to make your dream a reality! Please send a "Custom Order Request", we'd love to work with you.